There are times when there are places to go, things to do, and friends to see that days and weeks are full. Then I realized I have not written a blog. Such was the case in November. It was a beautiful month although some days were cold indeed. The wind, not as strong as the renowned Provençal mistral but not as benevolent either, chilled the bones even when the sun was shining. But the weather did not erase the loveliness of the vineyards as they burst (and faded) with red and golden colors. Tractors eased up on the village roads, wine vapors weakened, and our Languedoc sun played hide and seek. We took our chances and journeyed around towns and villages now that the tourists are gone. First daughter spent some time in Meynes (near Nimes) with a French family while second daughter and I explored Montpellier. First daughter enjoyed her immersion and gushed about the four course meals she had twice a day. “Mom,” she said, “they always have a cheese tray followed by desserts for lunch and dinner. It was goooooood!” And of course, she helped out in meal setting and clean up. C’est obligatoire. Meantime, second daughter and I overnighted in the lively city of Montpellier with the ubiquitous university students, shops and markets. We almost didn’t make it; frustrating as it was to find the parking garage. We circled the area of the hotel (with a map given by the reception) but the signage was poor and the traffic lights confusing. But we did make it, spurred by the desire to see the city before dusk settled. Here, second daughter had her first taste of roasted chestnuts and now eagerly looks for it in every village market. I stumbled upon a store that sold pickled green mangoes from Jamaica. Another source of comfort food to be enjoyed and shared with village friends. Our French-American friends had plans to return to Lourdes and we made a car trip out of it. Though it was only for the weekend, it was a pleasant drive made more so by the company and the conversation. And Henri, our canine companion, was easy and well-behaved. We made the obligatory rest stops for sandwiches and drinks. And we enjoyed a simple dinner in the heart of the virtually empty town. I never ceased to be in awe of Lourdes. The general atmosphere of fervent faith and unwavering confidence inspires the moment one enters the gate. It is always a privilege to hear mass here. This time, we celebrated mass in the Basilica. The hours for the piscine was short and we missed the window. But we know we will be back. She knows it, too. Amidst the many commitments that showed up this month, we celebrated birthdays, Guy Fawkes day (complete with effigy burning and fireworks -- enjoyed with a sumptuous dinner), and Thanksgiving. 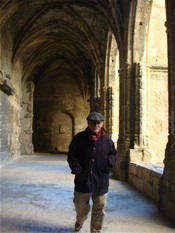 The latter was more memorable as it was my father’s first visit to our corner of France. Unfortunately, it was cold. Fortunately, it didn’t rain. And dinner was among a company of intimate and welcoming friends who served copious amounts of food and wine to last until the next year. It was, in my father’s words, “the best Thanksgiving ever.” C'était vrai.